Hasbro’s convention exclusives are now available for order at HasbroToyShop. Good luck and may the Force be with you. Here is just a friendly reminder that Hasbro’s convention exclusive go on sale sometime on Monday, Aug. 13. Bookmark this page for reference and make sure your order info is up-to-date for quicker checkout. EW has also revealed the SDCC exclusive Black Series Centerpiece Starkiller Base set which includes Rey and a new battle damaged Kylo Ren Black Series figure from The Force Awakens. For openers, the set includes a water mister for steam effects, and an acrylic light-up backdrop. Retail price is $109.99 and will be available at SDCC, Fan Expo Canada and Hasbro Toy Shop. Amazon is currently offering the new Black Series Centerpiece Kylo Ren for $41.00 with free one-day shipping for Prime members. 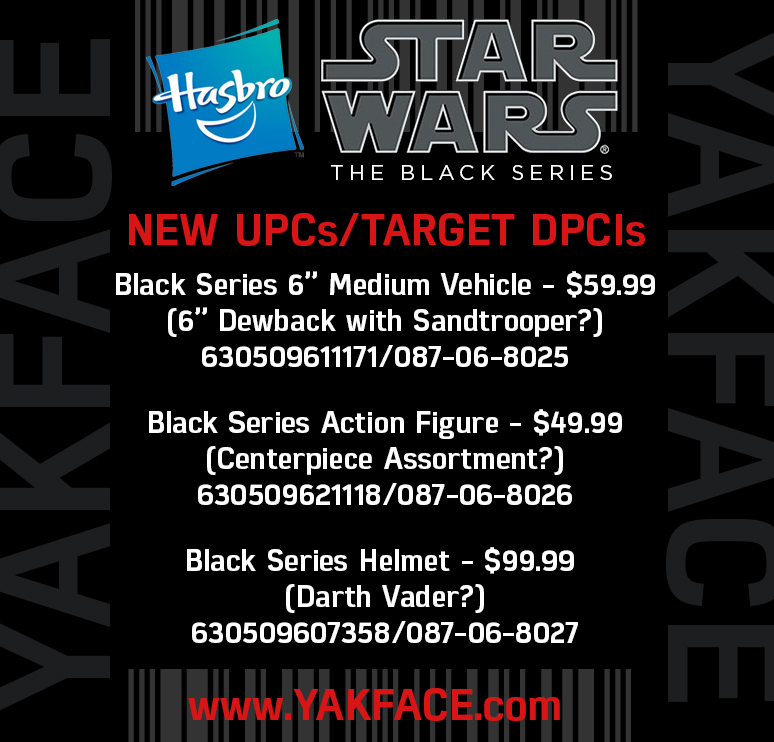 Using the power of Brickseek and the assistance of TargetGod, I was able to locate 3 new sets of product UPCs and Target DPCIs for upcoming Black Series products from Hasbro. 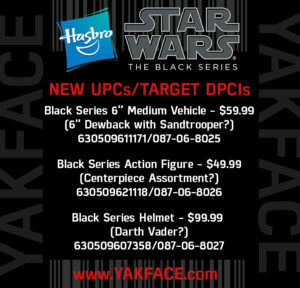 In the image above, you’ll see listings and pricing for a 6″ medium vehicle (Dewback with Sandtrooper? ), possible new Centerpiece figures (Rey and Kylo? ), and a new, most impressive helmet (Darth Vader?). Retailers are wasting no time starting their post-Christmas/end of year clearances. I braved my local Target this morning (Plymouth, MN) and snapped a few pics and grabbed a few items as well. At this particular store, you can find the Black Series Centerpiece Vader and Luke for $14.98 (reg. 49.99), Black Series Rogue One 3 pk for $17.98 (reg. $59.99), Target Exclusive Era of the Force Action Figure 8pk. for $19.98 (reg. 39.99) and Poe Dameron’s Ski Speeder for $19.98 (reg. $39.99). Head to your local store to find deals like these and more, and of course, your selection may vary. Jedi Temple Archives has leaked word that Kylo Ren and Rey are coming soon to the Black Series Centerpiece line. Look for these to be sitting on shelves in the near future. Those that were able to take advantage of early Black Series products offered via Kohls.com have started to receive their shipments. Jair shares the above tweet with us regarding his haul. 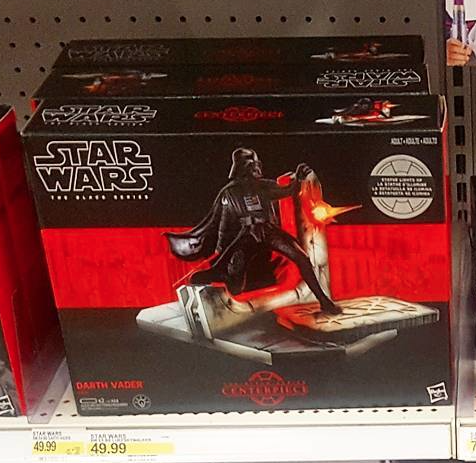 Bay area resident and Instagram user rmdcollctve reports finding new products for The Last Jedi as well the Black Series Centerpiece Darth Vader on shelf. One more this to add to your potential shopping list for Force Friday.